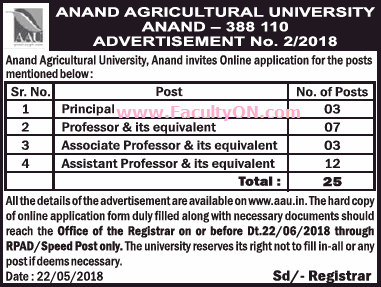 Anand Agricultural University, Anand has advertised for the recruitment of Professor / Associate Professor / Assistant Professor Plus Principal jobs vacancies. Interested and eligible job aspirants are requested to apply on or before 22nd June 2017. Check out further more details below. How to Apply: The hard copy of the application supported with copies of certificates, pertaining to the qualifications and experience should reach to the office of the Registrar, Anand Agricultural University, Anand on or before Dt.22/06/2018 through RPAD / Speed Post only. The University reserves its right not to fill-in all or any post if deems necessary.